As the Marvel Cinematic Universe enters its third phase, there have been questions of whether the journey the characters we’ve become familiar with (Iron Man, Captain America, Thor, etc.) have started to run stale. While Avengers: Age of Ultron had plenty of fun moments, a lot it operated as a commercial for the next installment. Ant-Man (2015) enters as a breath of fresh air as a pint-sized hero (with a new back-story and unique powers) joins the fray. This entry into the MCU cannon comes with the usual limitation of an origin story, but there’s enough offbeat quirkiness that allows it to stand on its own. There were a number of development issues reported, the most notable being the departure of writer/director Edgar Wright due to “creative differences” with the studio. Wright was attached to the project for a long time, even filming a short action scene that made waves online. After all was said and done, Wright received a story/screenplay credit while Peyton Reed (Bring It On, Yes Man) took over the director’s chair. It’s hard to say how much of Wright’s original vision was kept intact, but his fingerprints can be felt all throughout. A lot of the comedic tangents and dialogue play felt reminiscent to something you’d see from Shaun of the Dead (2004) or Hot Fuzz (2007). What we do get is a fun ride that resembles a lot of what we’ve seen from Marvel, but also something unique. Much of the joy comes from Ant-Man’s power to shrink to the literal size of an ant. This allows the filmmakers to be creative with staging the action set pieces. We see our protagonist ride on insects, burrow deep underground, maneuver his way underneath locked doors and pass through openings the size of a pinhole. The special effects are good enough to keep all this relatively believable. This set up works best when Reed cuts between large and small-scale perspectives. It was bizarre and hilarious to see Ant-Man engage in an epic battle with a villain in a space no larger than a dinner table. 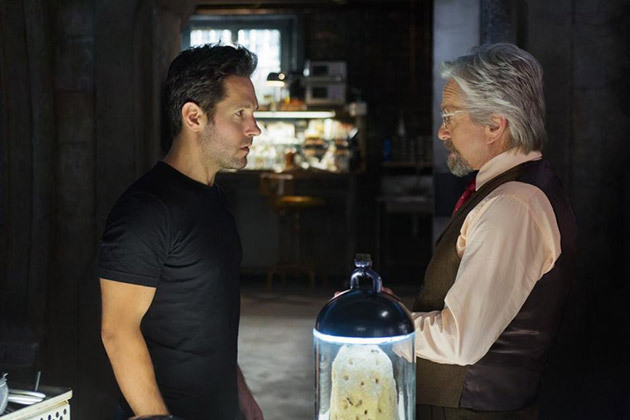 Paul Rudd stars as Scott Lang, a recently released ex-convict. The screenplay (Wright, Joe Cornish, Adam McKay, Rudd) tells us that Scott has a master’s degree in mechanical engineering, although it’s never explained how a guy so smart would fall into a life of crime. Down on his luck and desperate to reunite with his family, Scott flirts with the idea of going back to his burglar lifestyle. That is, until he meets Dr. Hank Pym (Michael Douglas) a renowned scientist who has developed a suit capable of shrinking anyone who wears it. After a strange series of events I’d rather not describe, Pym chooses Scott to become Ant-Man and use his newfound powers for good. You know, the usual stuff. The second act drags for a considerable length of time as Scott learns how to utilize his newfound abilities. There’s a lot of training montages and speechifying of the importance of the technology and how it shouldn’t fall into the wrong hands. I’m of two minds with this approach. For one, it’s nice to see a superhero narrative that’s stripped down to tell – for lack of a better word – a more “intimate” story. Yes the stakes are high, but it’s a relief not having to see a character fight a faceless army with the fate of an entire city on the line. But on the other hand, because this is (at heart) a conventional story of a redemptive hero, the plot points operate with familiar mechanics. Paul Rudd is his usual charming self, which works well for his character. Michael Douglas brings a nice gravitas to his role as the elderly tutor. 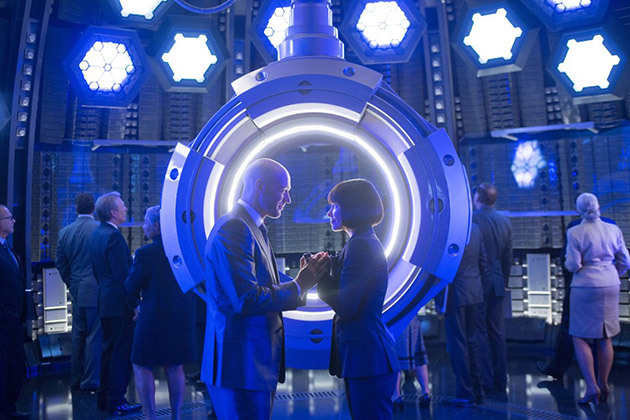 The supporting work by Evangeline Lilly, Corey Stoll, Bobby Cannavale, Judy Greer, and T.I. all serve their purposes as required. But it’s Michael Pena – playing Scott’s criminal right hand man – who easily steals the show. Pena garners the biggest laughs, and plays his goofy character without an ounce of irony. In two extended monologues, Pena’s narration combined with an eccentric editing style make for the most memorable sequences of the whole film. Although it does take a long while for the pacing to pick up, the third act brings it all together as Ant-Man and his friends fight main baddie Yellowjacket (Corey Stoll). The action scenes were very creative at this point, especially where the filmmakers decided to place the climax. Ant-Man changes sizes with rapid succession, going from big to small in the blink of an eye. His powers are something we haven’t seen before in the MCU; the wacky nature of it highlighted by the fact that he can shrink to sub-atomic levels. The rest of the Avengers all have their own powers and weaknesses, but none of them run the risk of accidentally disappearing from existence. Ant-Man is not perfect, but its entertainment value overshadows its defects. The performances of the main cast, the refreshing display of Ant-Man’s abilities, Michael Pena’s superb comedic role, and a weird yet dynamic finale make this a superhero blockbuster worth checking out.